The original adobe residence was built circa 1836 by Don Rafael Gonzales, customs administrator at the Port of Monterey. From 1856 until the end of the l870s, Juan Girardin operated a general store on the lower floor. He and his family lived above the store and rented out some cheap rooms for boarders. The rooming house was called the French Hotel. For a few months in the autumn of 1879, a young, unknown writer named Robert Louis Stevenson boarded at the French Hotel while courting his future wife, Fanny Osbourne. 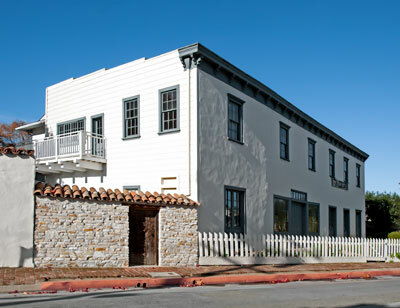 The Stevenson House, a component of Monterey State Historic Park, is sometimes open to the public. The Robert Louis Stevenson House is California Historical Landmark 352.